Albright tail lift solenoid starter switch/dc contactor. 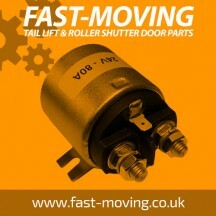 At FAST-MOVING.co.uk we pride oursel..
Tail lift solenoid starter switch/dc contactor - Bosch style. This is a dc starter ..
Tail lift solenoid starter switch/dc contactor - Iskra style This is a dc starter s..
Tail lift solenoid starter switch/dc contactor - Sputnik style This is a dc starter..
Tail lift solenoid starter switch/dc contactor - Winch style This is a heavy duty&n..